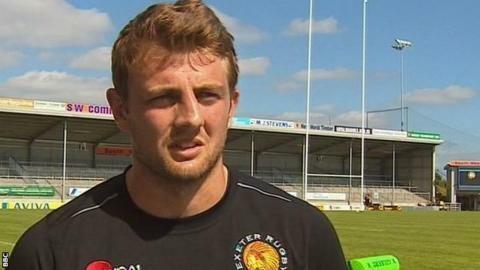 Exeter Chiefs back rower Dean Mumm is looking forward to working hard for his shirt at the Premiership outfit. The ex-Australia international forward signed a two-year deal in April from Super 15 side New South Wales Waratahs. "These guys have been working extremely hard together as a team. There's a lot of learning for me to do," the 28-year-old told BBC South West. "Any hope of getting on the field will be off the back of training well and that's my immediate aim." He continued: "I'm not a super-flashy player and if I can get into what is a pretty successful climate and culture and add a little bit to that I'll be happy. "My aim for the meantime is just to get in, get on the field and get my first Chiefs jumper." Mumm, who can play either back row or second row and has won 33 caps for Australia, took advice from former Chiefs players Peter Kimlin and Chris Malone about the set-up at Exeter before putting pen to paper. "Everything they've achieved has been through their own efforts and that's something I found very appealing to come into," Mumm added. "That sort of work ethic, sense of achievement and sense of ambition drew me here. It's something I'd love to add to." The Chiefs' new signing missed the start of the season as he was involved with the Wallabies in the Rugby Championship.